UHD51A’s image quality immediately gets a thumbs up. With both HD and UHD sources, there are admirable levels of detail on screen. The projector is HDR compatible and makes a good fist of high dynamic range content. It’s easy to be impressed by Optoma’s UHD51A. It’s a well built, high-performance 4K projector, bolstered by topical smart home functionality. Image quality is generally great, and its 3D performance entertaining. Alexa can turn on your home cinema projector, but that’s not the only reason to love this UHD-capable Optoma. This compact projector doesn’t just look crystal clear with 4K content, it’s also compatible with 3D too. TVs may have given up on the third dimension, but you can carry on watching your 3D Blu-rays on the bigger screen. The UHD51A is bright, with cinematic contrast. While you’re still going to get the best performance out of the UHD51A in a dark room, even the casual home cinema enthusiast will be able to appreciate its scale and detail if used during the day. At this price you’re going to be hard pressed to find a projector that can deliver this level of picture quality and this feature set more confidently. 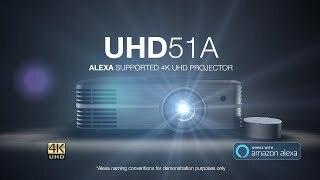 The UHD51A works with Alexa, making it smarter than any other 4K UHD projector under $2000 to date. Count the UHD51A as one of the best sub $2000 4K capable projectors on the market. If the features and other trade-offs align, it will be your best choice for the money. It definitely earns a Hot Product Award. The Optoma UHD51A is a fully modernized projector with essentially every feature you want. What it brings to the table is essentially all of the latest and greatest improvements and technology standards to video quality. It has things that might ordinary sway you into choosing a TV over a projector, like high dynamic range (HDR), 4K UHD resolution, and a wide gamut of vivid colors. And it has the same voice-assistant and streaming power that you’d find on a modern smart TV. Combined with every advantage that you use a projector for in the first place, the Optoma UHD51A has plenty to offer. For watching your favorite shows and movies, the Optoma UHD51A has all the essential ease-of-use kind of features people want from their home theater. We bought the Optoma UHD51A projector when we moved house as we work in the entertainment industry and for less than the price of an equivalent TV, we got our hands on an incredibly capable projector taking up very little room on a shelf above our sofa. Setting up was relatively simple - once viewing distances had been calculated, it only took a couple of minutes to get the UHD51A fired up, the fine zoom adjusted and the focus sharpened. Once calibrated, the UHD51A kicks out a beautiful and deep 4K image. On our 92in screen viewed from approximately 120in away, the “faux” 4K image is barely distinguishable from the “true” 4K of far more expensive models, HDR content (which is automatically detected by the projector) is rich and realistic, and even lower resolution and SDR content is presented beautifully. The image isn’t the very brightest, so daytime viewing is a little washed-out as you might expect, but with the current limitations of DLP rgbrgbrgb chip technology, it’s as good as you can hope for. Picture modes work a treat, with built-in presets and user-defined ones easily accessible and switched. Optoma’s puremotion frame interpolation is subtle and useful, making most tracking and fast-moving shots smoother than you might expect. Rainbow artefacts are occasional, but pretty minimal, too, which is a relief. Sound is surprisingly good - the projector of course makes some noise, but it’s quieter than many other models out there, and the internal speaker puts out a very listenable sound. It’s not something I would choose to use to listen to a film’s soundtrack, but it will do the job for casual use, or for that time when your AV system isn’t working properly. The menu is, for the most part, easy to navigate and understand, although there are a couple of small niggles. The main one of those is that if the device you have connected is outputting at 4K (ie a new Apple TV, or an Amazon Fire TV 4K, or even a PS4 Pro or a UHD Blu-Ray player), then there is absolutely no way to activate 3D on the projector. This is not explained anywhere in the manual or online - it took contacting Optoma’s support team and asking for help in forums to discover the fix: you must change the setting on your connected device to 1080p (usually at 50hz) before the 3D option is selectable on the projector. It’s doable and not the end of the world, but Optoma really should make this clear either in the manual or in the menu system. The on-board media player is simple to navigate and has very good compatibility indeed, with most file formats accepted and played without fuss (though 3D doesn’t seem to be an option here, disappointingly). There is quite a significant issue with the USB inputs, though: the UHD51A currently only accepts USB drives formatted in FAT or FAT32, which means that the largest file that you can play on the projector is 4gb. I work with and am sent a lot of 4K footage, and those files are often far bigger than 4gb, so currently they are unplayable on the UHD51A. This is something that Optoma could easily fix with a firmware update, and I sincerely hope they do so ASAP as it’s rather an important feature to someone like me. On the subject of firmware updates - the UHD51A’s small wireless adapter works well, with screencasting and Alexa operating pretty seamlessly (though the Alexa skill could do with some development as its implementation is pretty basic so far). Another relatively small niggle is that the projector has two ports for its one wireless adapter, and they both have different functions. For example, one port deals with firmware updates and wireless screencasting, whereas the other deals with another type of OTA update and Alexa operation, so you can’t screencast and use Alexa without switching the wireless adapter between ports, meaning you have to mess around with the body of the projector - something that nobody particularly wants to have to do much once they’ve set up their system. Overall, I’m delighted to have purchased the UHD51A - when it comes to projectors, picture quality is of course what matters, and in that regard this projector is the best I’ve experienced in its price bracket. Most of the niggles I’ve encountered with the software are relatively minor, and even the problematic USB formatting situation could be easily remedied with a firmware update, and hopefully Optoma will address that in the near future. If and when they do, I’ll update this review. At its price point, I wouldn’t hesitate to recommend the UHD51A - I have a feeling it’ll provide us with years of great entertainment. I had been thinking of buying an Optoma UHD51a projector for quite some time after reading many reviews on it. I already owned an Optoma HD230x projector and wanted to upgrade it. When I seen the deal Amazon had on this projector in their Black Friday deals it was too good not to buy it. On receiving it I immediately set it up and I have to say it did not disappoint. The colours are much brighter, the image sharper, I absolutely love it. I am now looking to buy as may 4k blue ray discs as I can to get the full benefit of my projector. I would recommend this projector to anyone who is looking to buy a 4k projector.